Keystone Academy is a Chinese school with a global program and a world flavor. We are honored to be located in Beijing, our capital city, a place of vibrant political, cultural, and historical significance. Our mission as a school is to bring together the best of three rich, deep educational traditions: the Chinese, the American, and the global. What we do inside and outside the classroom is like a brilliant cloth of three colors: however, it is the Chinese that is the main thread in this weave. We want all our students, Chinese and non-Chinese, to be knowledgeable and proud of the powerful past and promising future of China. To achieve this, our Chinese Thread brings out the pattern, in every grade of the school, of the language, history, culture, and identity of China. This focus on China and its contribution to the world allows our teachers and students to achieve a richer, more nuanced understanding of the world and their place in it. It imparts to students the critical thinking skills that will help them get ahead in the world of global exchange, politics, and culture. It inspires in students a love for learning, a respect for their own traditions and cultural differences, and a recognition of the relevance of high-level scholarship. Contemporary instructional philosophy, reinforced by some recent research in neuroscience, indicates that a potent way to achieve deep, global learning is through an integrated and interdisciplinary curriculum. We have designed just this for the Keystone curriculum, consistently linking elements of Chinese language, cultural history, and visual and performing arts through all the divisions and all the disciplines. We do this through coherent, methodical curriculum planning, through innovative teaching pedagogies, and through experiential learning opportunities for students in and outside the classroom, in the residential halls, on the fields, and in the local and global community. The simple fact that all our students study the Chinese and English languages to a high level of proficiency and fluency indicates our commitment to the significance of China in the world.In all years, the Chinese Language and Literature courses are closely aligned with the school’s Five Shared Values, and allow students to explore literary themes in the cultural history of China. Keystone Academy Primary School uses the International Primary Curriculum as a structure to deliver integrated studies from Foundation Year through Grade Five, in a bilingual immersion context. The IPC curriculum approaches learning thematically: this facilitates the integration of Chinese cultural history and the Chinese National Curriculum objectives and standards in all domains. For each unit, there is the opportunity to compare China with other cultures in authentic and engaging ways. There are also clear links between the integrated units and the Keystone Five Shared Values that guide our school.The Chinese Thread is developed in subject specific courses, as well. In Primary School arts courses, students study ceramics, painting, and calligraphy in the context of Chinese artistic skills and traditions, and classes in music and dance reference Chinese performance arts.A robust program in wushu, and Chinese conceptions of health and wellbeing, serve as the cornerstone for Physical Education and Wellness courses. In the Middle School, the Chinese Thread finds fuller, more academic expression, through both the links to specific disciplines, and by means of a specially designed course called China in the World. 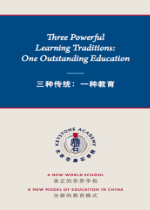 This special Keystone course is comprised of ongoing classes in Chinese Civilization, Chinese Visual Arts, Chinese Performing Arts, and World Civilization.Taught as an integrated curriculum, China in the World fits in the International Baccalaureate Middle Years framework; the themes and topics align across the different classrooms to encourage critical thinking and provide coherence in chronology and theme. Students get a deeper and clearer understanding of how events in our world are linked and influence each other across different times and space.Our students graduate understanding changes in Chinese history and culture in relation to historical transformations in world history and culture. Furthermore, they graduate with real proficiency in one of the Chinese Arts, visual or performing, and can thus serve as effective ambassadors from China when they travel for study and work and participate in the global networks that characterize the world today.Themes from Chinese literature are explored in significant ways in Chinese Language and Literature classes, and faculty from other domains, such as Mathematics, Science and Design, for instance, make every effort to create authentic links with materials relevant to and enriching of the Chinese Thread. By Grade Ten, students are prepared to engage in the Keystone Capstone Project about Chinese cultural history or the arts; this provides the background and experience of focused study called for in the Keystone Diploma. This kind of concentrated and project-based learning at the conclusion of the Middle School gives students the opportunity to delve into Chinese culture while simultaneously preparing for the rigors of independent work required in High School. In Grades Eleven and Twelve, students are enrolled in the International Baccalaureate Diploma Programme.The three core components of the Theory of Knowledge course, Creativity, Action, and Service, and the Extended Essay offer valuable opportunities for multiple expressions of the Chinese Thread.The Keystone TOK course is designed as a bilingual, bicultural class in which teachers and students work in both languages to explore deep philosophical questions, comparing different expressions of culture, language, and worldview.Practical and place-based experiences in service, action, and culture allow for real-life engagement with the Chinese Thread.Experiential learning and independent scholarship are key pedagogical devices for learning at this high level of high school study. Since all Keystone students are engaged in the these studies, the Chinese Thread becomes an important component in forging the identity of our Keystone graduates, helping them to define and appreciate the significance of Chinese culture, and helping them become ambassadors of the home culture as they prepare to move away to colleges, careers, and the world after school.